How much does it cost to travel to Lima? How much money will you need in Lima? S/.229 ($70) is the average daily price for traveling in Lima. The average price of food for one day is S/.52 ($16). The average price of a hotel for a couple is S/.295 ($90). Additional pricing is in the table below. These average travel prices have been collected from other travelers to help you plan your own travel budget. How much money do I need for Lima? Lima, the capital city of Peru, is likely to be your point of entry for the country. Lima was founded in 1535 and was the seat of the Spanish rule for 300 years. It's a surprisingly modern city despite its rich history, but many beautiful churches and colonial architecture remain today. There are also large slum areas that highlight the poverty that exists in the city. The city and its surrounding metropolitan area have a population of about 8.5 million people, many of whom came from the Andes Mountains in search of work. Unfortunately the work opportunities are limited and the poverty is obvious as you arrive in Lima. Lima's climate is mild and warm. It's located in a desert in the tropics, but its proximity to the Pacific Ocean keeps temperatures cooler than you might expect. Temperature extremes are rare and lows rarely fall below 55 degrees Fahrenheit while highs are rarely above 85 degrees Fahrenheit. There are two distinct season: summer, between December and April, and winter between June and Octobers. May and November are transitional months where temperatures are less predictable. Lima has a historic center that has been declared a World Heritage Site by UNESCO. There is impressive colonial architecture throughout with highlights being the Monastery of San Francisco, the Plaza Mayor, the Cathedral, Convent of Santo Domingo, and the Palace of Torre Tagle. There are many impressive churches throughout the city that date back to the 16th and 17th centuries. Some interesting ones include the Cathedral of Lima, the Monastery of San Francisco, and the Sanctuary of Las Nazarenas. There are also several beaches along the Pan-American Highway that you can visit during the summer months. Lima also has the highest concentration of museums in the country. The most famous are the Museo Nacional de Arqueología, Antropología e Historia del Perú, Museum of Art of Lima, the Museo Pedro de Osma, the Museum of Natural History, the Museum of the Nation, The Sala Museo Oro del Perú Larcomar, the Museum of Italian Art, the Museum of Gold, and the Larco Museum. There are some interesting districts in Lima. Barranco is known for its nightlife, bohemian vibe, and beachfront location. Centro Historico, in central Lima, has the highest concentration of colonial buildings, churches, and shopping areas. Miraflores is a more touristy, upscale neighborhood with great restaurants. San Isidro is a residential area with many hotels, restaurants and shops. It's a great area to walk around. Other residential areas include La Molina, La Planicie, San Borja, Surco, and Monterrico. There are a variety of activities that you can enjoy while you're in Lima. Live folklore shows are a popular activity. Peruvian horses and Marinera Dance Shows are interesting. Sporting events are also fun to attend. Soccer is popular as is fronton, which is a racquet sport comparable to squash. 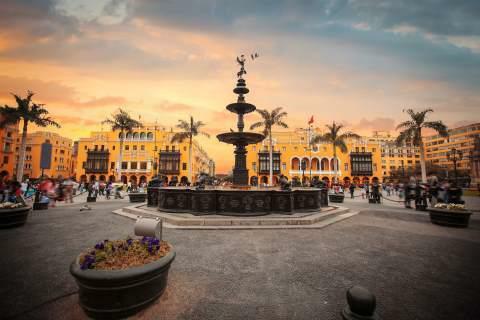 As Peru's capital city, Lima has some of the best food in the country and it is easily the best place to sample some interesting Peruvian specialties. Some of your more interesting options include ceviche, which is very popular throughout the country, and other seafood options. You will also find all kinds of international cuisine throughout the city including Indian, Chinese, and other types of Asian. There are also some typical western fast food restaurants if you're feeling a little homesick. The city also has no shortage of bars and clubs. There are plenty of places to grab a quick drink or meet up with fellow travelers and swap stories until late in the night. You can expect to pay more at the places that are targeted specifically at tourists, as there will be a marked up price. There's public transportation in Lima in the form of buses and a limited number of trains, but taxis are a good and cheap option in the city as well. Taxi rides between neighborhoods typically cost about US$2 if you can negotiate hard. Longer rides could cost as much as US$7. You must negotiate the price before getting in the vehicle because taxis do not typically have meters. Make sure the rate has been set before you get in the car. Micro buses or combi vans are small buses that get very crowded. There are designated stops where you can get on, or you can occasionally flag them down. Larger buses are also available on most routes and they are slower, but slightly safer. Metropolitano is the rapid transport bus system. It's a modern system with dedicated lanes on express ways. Metro de Lima is the metro system that has one fully functional line with 26 stations.